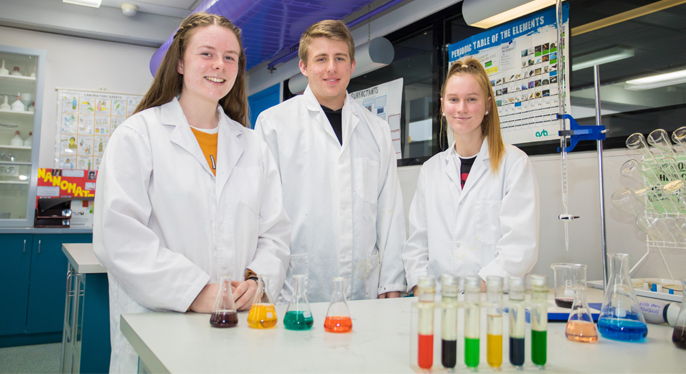 Congratulations to Chemistry students Emily Seery, Jack Allie-Evers and Emily Mannix who are national finalists in the RACI Australian National Titration Competition. The team finished 14th out of 322 in the State competition; an outstanding achievement. The scientific aim of the competition is to determine the strength of a weak acid solution of unknown concentration by carrying out a series of acid-base titrations. Teams are ranked on how close they get to the actual concentration. Emily, Jack and Emily will compete in the National final next Thursday; a three-hour challenge that sees them compete against the best teams from around Australia. We’ll keep you posted on their progress.